Climate change could alter so many weather and environmental elements that entrepreneurs are seeking to cut out weather altogether. By fusing together agriculture and technology, indoor farming start-ups are striving to create weather-independent environments and to improve the human health condition. According to studies conducted by Exeter University, plant-rich environments providing clean air can boost creativity and productivity, improve your mood, reduce stress, and energize your body. 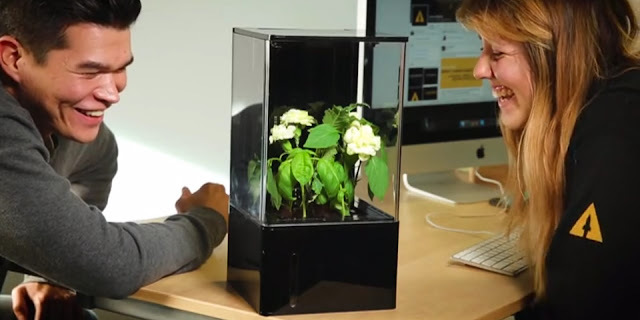 therapy device to improve air quality, light biology, and plant growth. 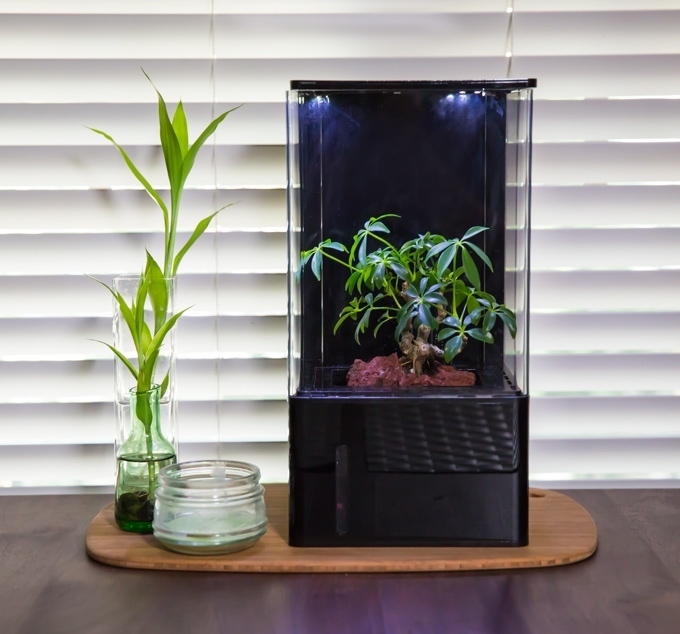 The EcoQube air is the best solution for indoor gardening because it provides the perfect environment for plants to grow. 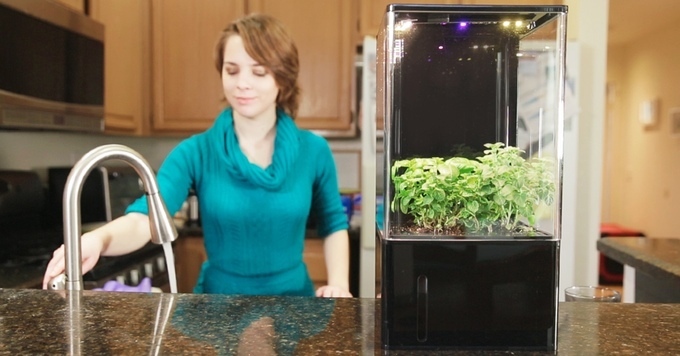 It uses basil to filter water and incorporates hydroponics, which produces high yielding, abundant plants. The greenhouse requires minimal maintenance, and automatically begins working once it's plugged in. ADI Ventures is founded by UC San Diego students and aquarium geeks who met in high school. They instantly became intrigued by planted aquatic ecosystems and have spent the last 8 years learning about them and building them. An inspiration for creating this product came from the present challenges that humanity is facing of food and water shortage. So they decided to use the knowledge of building aquatic ecosystems to introduce the concept of aquaponics and the beauty of a sustainable ecosystem to as many people as possible in the world. The EcoQube Air is sized as appx. 7” x 7” x 16”, works hydroponically, meaning plants will grow soilessly, in a plant medium with water pumped through it. Hydroponics is a method of agriculture that grows plants without the use of soil. Water infused with fertilizer is introduced to the system where it is absorbed by the plant medium and subsequently the roots. It requires water only once a month. All of the water in the system is in a closed cycle, so the water will be lost at a very slow rate. The EcoQube Air comes installed with a Drain Spout for easy water changes. Simply pour new, fresh water into the water basin and increasing water pressure will push older water lower in the basin out through the spout. 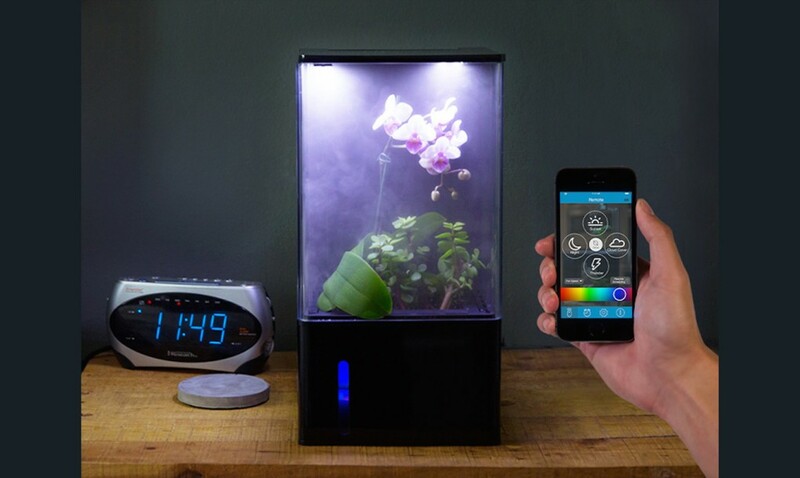 You can use the EcoQube Air to influence your own biological clock with the phone app. This helps you wake up feeling refreshed, alleviates insomnia, helps overcome jet lag, improves productivity, and helps prevent seasonal depression. Use the phone app to pre-program specific light schedules, change colors, adjust weather functions, or control your light from across the room. Regarding the power requirement, it’s a energy conservative product, as only power used is in the energy efficient LEDs, air intake fans, and the small water pump. In the UV / Fogger model, a small amount of extra power will be used for those two functions. Join their movement to educate everyone about hydroponics and aquaponics, promote sustainability, and transform our living spaces. Let’s bring nature back into our lives and blur the lines between the outdoors and indoors. Presently, EcoQube Air crowd funding campaign is live at Kickstarter and original goal of US $ 25,000 has been exceeded more than ten times! The campaign offers pre-order discounts and other backer incentives. Funds from the campaign will be used to complete manufacturing and commercialization of the EcoQube Air that is slated to be on the market January 2017.